Call a halt to that HDD error message. Our friendly team are here to help recover your video data. Even JVC Service Centres have sent faulty camcorders to us so we must be doing something right! HDD error, what has happened? This is the last message you wanted to see on your camera after recording precious scenes of wedding, birthday footage, movie of Aunt Vera's last visit (even though you can't stand her), or early years of your child, or even the birth. 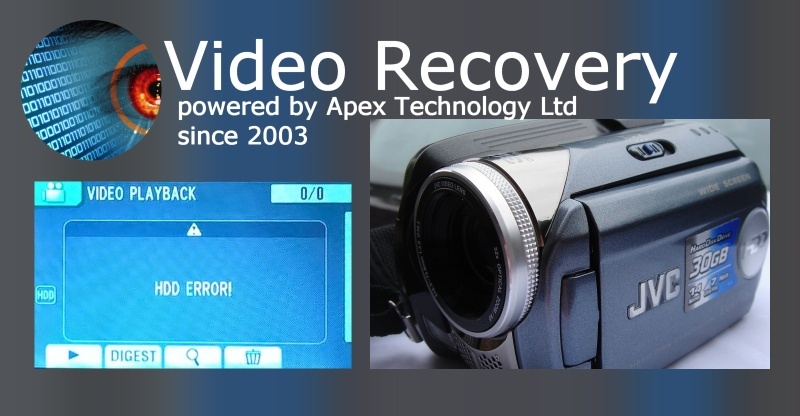 We commonly see it on the JVC Hard Disk Drive Camcorders and below is a list of just some of the cameras we have recovered the video from after the error screen appeared. The message does not lie - you really do have a hard disk problem, and it is usually down to bad sectors. Even if you didn't see any evidence of degradation last time you used the camera, you can almost guarantee areas of the disk surface are growing weaker as time goes on. Every impact, vibration and shock is slowly eating away your camera's HDD. JVC said they could not fix it without reformatting the Hard Drive which would loose all the data so needed to recover the video footage data that was still on the disk. The JVC Everio hard drive camcorder is displaying the HDD-ERROR message. The format, clean up and reset functions are non operational. Is there a way to recover the lost files and make the camcorder work? I think The Data Cable on extended battery shorted and power failed, resulting in the HDD error. Accidentally pushed the "Digest button when I meant to hit "play", and then closed the camera view screen before it finished the function. Now I get HDD error and the camera is locked up. Suddenly developed a fault and reported corrupted hard drive. Hdd error appears on the screen when you switch it on. Can't access any data. All is not lost and we have recovered the video for many customers, even when JVC have not been able to undertake the work. The first thing we do is to secure all the data from the camera to another hard disk drive or clone it. This ensures that should anything go wrong during the recovery, that your original data is not corrupted. Once the data is recorded to a new hard disk, we shall reconstruct the data to the original video clip sequences. Over time the video on your hdd will have become fragmented to small pieces and not stored in a single continuous sequence. This is because video will have been deleted and new video occupying its space on the HD. Once we have all the scenes pieces in the correct order, we copy it to another drive for sending back to you. You are welcome to supply a disk or we can do it for you. HDD error JVC Everio Camcorder Hard Disk Drive problems that we recover data from are listed below. JVC Camcorder hdd error recover video clips movies from hard disk drive error when accessing camera failure to play back files of recorded videos usb transfer.